The Houston Chapter is proud to support our community through sewing. We participate in Houston-based projects as well as the American Sewing Guild’s national community service project. The Community Service Project for 2018 is You Pick a project. We have been contacted by several groups need help with projects. They are listed here for members and Neighborhood Groups to decide what is best for them. You will first be asked to complete the Volunteer Profile and Confidentiality form and return them to Janie Bennett. You are provided with material to make one bear initially so we both learn if you are comfortable using the pattern and completing the project. Please use your creativity to bring the bear to life! When you complete your initial bear, Janie Bennett will provide you with instructions for how to return it postage paid. All supplies will be provided. Work at your own pace and schedule. The 2017 Houston Chapter Community Service Project is "Gwen's Girls" in memory of one of our charter members. Gwen was very passionate about this project so members are asked to make "pillowcase dresses" for the Little Dresses for Africa project. You may find more information about the Little Dresses project on this website, Little Dresses for Africa. The Houston Chapter's Community Service project for 2016 is a drawstring bag and pillowcase set to be given to local Women's Shelters. You may click here for the instructions for the pillowcase and drawstring bag. The Houston Chapter’s Community Service project for 2015 is Care Wear. Click here to go to the Care Wear website. Care Wear is a nationwide group of volunteers who knit, crochet, and/or sew, providing handmade baby items directly to hospitals. All Care Wear items are distributed by hospital staff (FREE) to infants, children and their parents. This project allows chapter members and Neighborhood Groups to choose which items to make and then donate to local hospitals. Members can find patterns, instructions, and labels on the Care Wear website for quilts and blankets, kimonos, baby gowns, and many other items needed in hospitals for families. In addition, there are patterns for simple stuffed bears and bunnies, chemo hats and walker caddies. A size chart for the blankets and afghans is also included in the pattern area. Print the labels to attach to the donated item. Teach Another Generation! T.A.G. A project to support the new Junior Membership at special classes to be held during Conference and in youth outreach programs throughout the country. To see the instructions, click here. 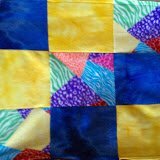 The Houston Chapter of the American Sewing Guild is continuing the blanket project from 2012. Each NG will make lap blankets to be given to the VA or hospice patients, or receiving blankets for babies at Lyndon B. Johnson General Hospital. Click here for the PDF with instructions for the blankets. For more information about these past projects, visit ASG.ORG. Each ASG chapter made blankets for its own community. The Houston chapter partnered with the Harris County Hospital District (Ben Taub and Lyndon B. Johnson General Hospital) to provide lap blankets for their oncology patients. The blankets are a part of the Compassionate Care Project that serves the terminally ill. The 2011 national community service project was the Painted Turtle Pillow. The pillows were sent to the Painted Turtle Camp, which is dedicated to children with life-threatening illnesses. In addition to the national project, our chapter worked on a local project making Cool Ties. These ties are strips of fabric with a sealed pocket in the middle that holds polymer crystals. Recipients dip the ties in cold water or chill the soaked ties in the refrigerater, and the water-filled crystals stay cool for hours (when the head and neck are cool, the rest of the body is cool, too). Project leader Nancy Maranto worked with Meals on Wheels to distribute the Cool Ties to Houstonians who lacked air conditioning, giving them some welcome relief from the blistering summer heat. The 2010 national community service project was drawstring bags for Operation Care Package, which were filled and mailed to U.S. Troops. The 2009 national community service project was pillowcases for sick children and their families. We made them in children’s prints and bright colors and donated them to local Ronald McDonald Houses. The 2008 national community service project was the Anti-Ouch Pouch, a pillow that hangs from the shoulder and fits snugly under the arm to cushion the area after breast surgery or during radiation treatment. It was developed by Deon Maas and is dedicated to her mother, Doris Lock, who taught her to sew.